Safety was at the heart of the industry’s agenda at UK Construction Week 2017, and in response to the keen interest shown recently in the advanced Tyvek® FireCurb™ building membrane, the Tyvek® Building Knowledge Centre was on hand to display and discuss its benefits at the show. Understandably, the concerns of the industry are now tightly focussed on the various materials and methods that can enhance occupier and first responder safety in the event of a fire. 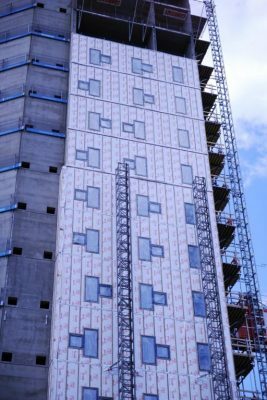 Launched in 2012, Tyvek® FireCurb™ Housewrap is particularly relevant as it is suitable for installation in high rise buildings, for use with ventilated façades, and for wall membrane applications in timber frame constructions. The product offers an innovative flame retardant technology that reduces flammability by using a phosphorous containing agent, which forms a ‘char’ layer at the surface when in contact with an ignition source. This thin layer of carbonized polymer is highly resistant to burning and creates a barrier, thus slowing the release of flammable materials from the membrane into the fire. Starved of fuel, the flame spreads over the membrane more slowly, or not at all. Tyvek® FireCurb™ Housewrap breather membrane uses a special technology to inhibit the propagation of flames. It is suitable for applications in tall buildings such as the multi-storey Lerkendahl Hotel in Norway. Tyvek® FireCurb™ produces less smoke if it does burn; a further advantage for people attempting to flee a burning building, while also limiting flame propagation between floors via the external envelope. Offering extremely high levels of flame retardancy (up to Class B) Tyvek® FireCurb™ Housewrap delivers multiple benefits at a competitive cost. The flame retardant performance adds to the many highly-valued properties of DuPont™ Tyvek® breather membranes, such as long-term wind, water and weather protection, effective vapour diffusion and a significant contribution to energy efficiency and interior comfort. Tyvek® FireCurb™ Housewrap has been installed in high-occupancy and public use buildings internationally, such the Lerkendahl multi-storey hotel in Trondheim, Norway, the Crumlin Children’s Hospital in Dublin and the Museum of Fire in Zory, Poland (below). DuPont™ Tyvek® advanced building membranes are unique in the market due to their high-quality single layer construction. Tyvek®, in all its specialised versions, is naturally vapour open but also durably wind and water-tight. Lightweight yet robust, it is easy to install and offers long-term, proven reliability. 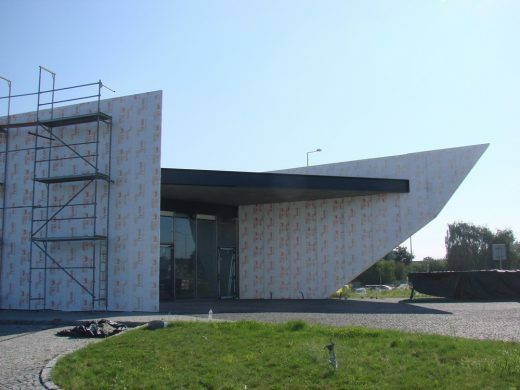 Designed to protect the building envelope against the effects of weather and moisture, this family of membranes also offers optimal air-tightness and can help to improve the thermal performance, energy-efficiency and interior climatic stability of a building. 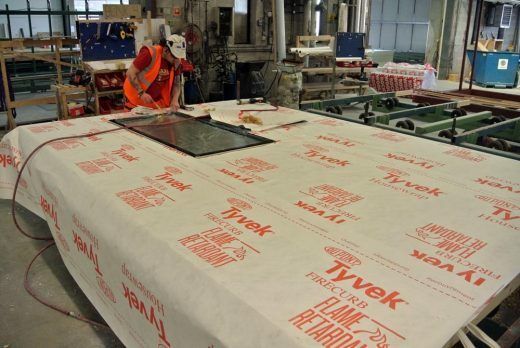 Tyvek® FireCurb™ Housewrap offers the added value of enhanced fire safety. Tyvek® is also designed to work as part of a holistic and optimal system with a range of other proven DuPont™ Tyvek® products for the building envelope, including the DuPont™ AirGuard® advanced AVCL series, the highly versatile Tyvek® FlexWrap NF and EZ sealing tapes, plus other specialised membranes, tapes and sealants. All DuPont building products come with the renowned service, expertise and technical back-up of a world-class science company.